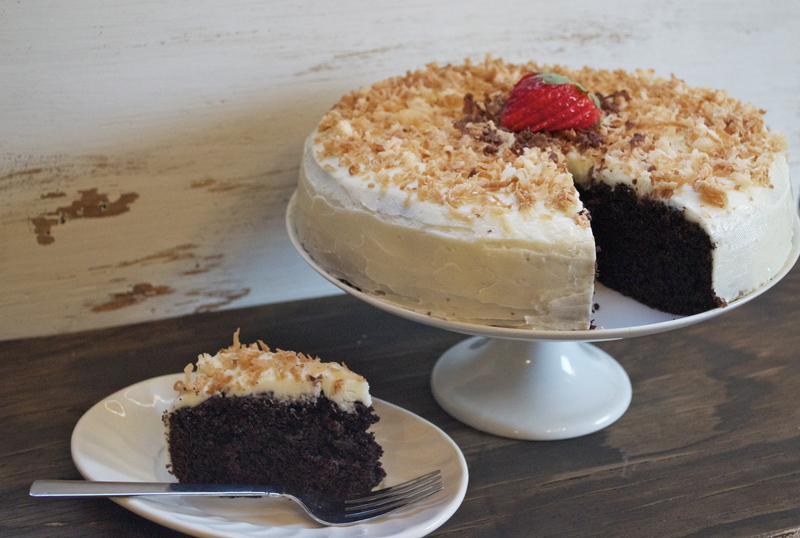 If the winter weather has you feeling down, baking this decadent cake is a sure-fire remedy. 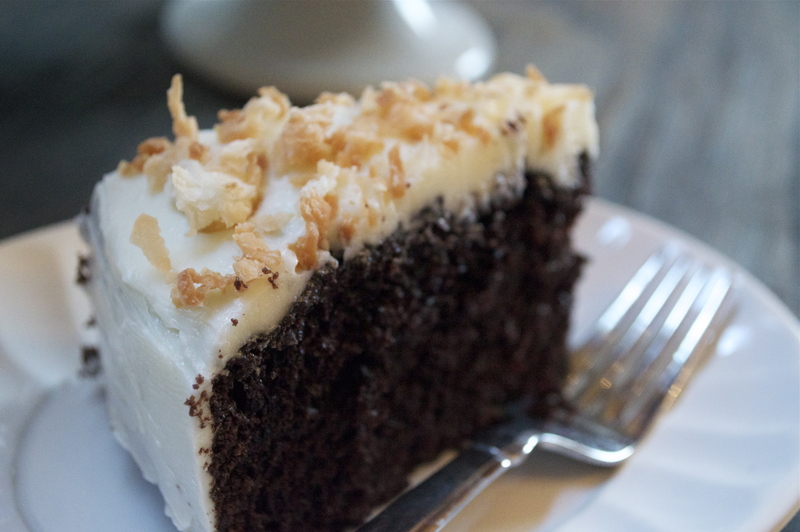 The rich dark chocolate, creamy coconut buttercream frosting, and crunchy toasted coconut topping will have you shedding your winter blues in no time. Don’t have any buttermilk waiting in the fridge? Make a substitute with a little less than 1 cup of milk and a teaspoon of lemon juice. Let it stand for about 5 minutes before using. Preheat the oven to 350°F, and line a 3×10 round cake pan with parchment paper. If you’re not up to using geometry to figure out how to line a round pan with square parchment paper, check out this step-by-step guide. Once you’ve lined the pan, grease the bottom and sides with softened butter. Then take a heaping teaspoon of flour and coat the pan. The original recipe (by the fabulous Barefoot Contessa herself, Ina Garten) uses two 2×8 inch round pans. I chose to use one bigger pan because I didn’t want to make a filling between layers (read: this was the only cake pan I could find). Thankfully, my pan was almost equal in area to the two smaller pans, so I knew the batter would fit just fine. Whisk the flour, sugar, cocoa powder, baking soda, baking powder, and salt in the bowl of an electric mixer. In a separate bowl, whisk together the buttermilk, oil, eggs, and vanilla. Using the paddle attachment on low speed, gradually add the wet mixture to the dry mixture, stopping to scrape the sides of the bowl if necessary. Next, slowly add the espresso and mix until combined. The batter will be very wet. Warning: As the hot coffee hits the batter, your kitchen will instantly be filled with such a heavenly mocha scent that you might consider sticking your face directly into the bowl. Resist. Just hold out for one more step, and then it’s time to lick the beater. Pour the batter into your cake pan (commence beater licking) and bake it for about 40 minutes or until a toothpick comes out clean. Let it cool in the pan for about 30 minutes, then let it finish cooling on a rack. Using the whisk attachment on a mixer, beat the butter on medium/high speed for 2-3 minutes until creamy and smooth. Alternate adding the sugar and coconut milk, until all the sugar is absorbed and the frosting reaches your desired consistency. You may not use all the milk depending on how thick or thin you want your frosting to be. Heap the frosting onto the top and sides of the cake, and use a spatula to spread it evenly. You’ve made a cake and some frosting, but you’re not done yet. 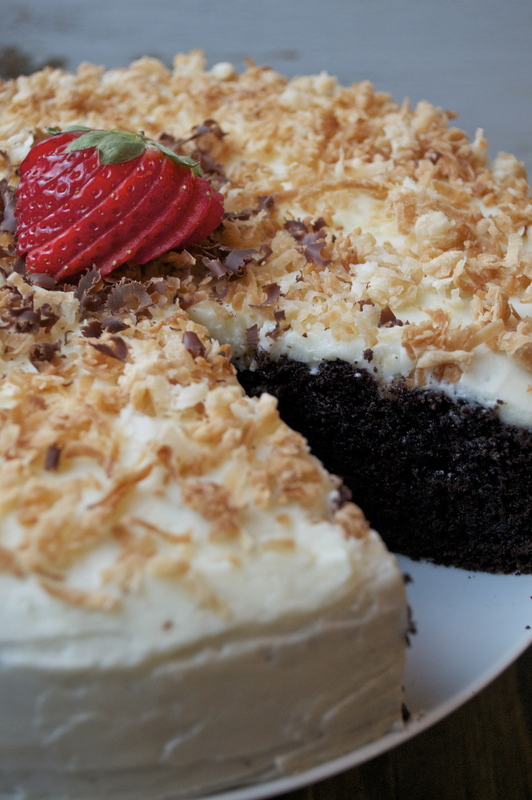 What would a chocolate coconut cake be without some golden, crispy toasted coconut on top? To toast coconut, spread sweetened shavings onto a baking sheet. Place them in an oven preheated to 325°F and bake for about 8 minutes, shaking the pan every 2 minutes to prevent burning. If you have some extra chocolate and berries in your kitchen, feel free to garnish your cake with some chocolate shavings or a brightly colored berry (or both!). 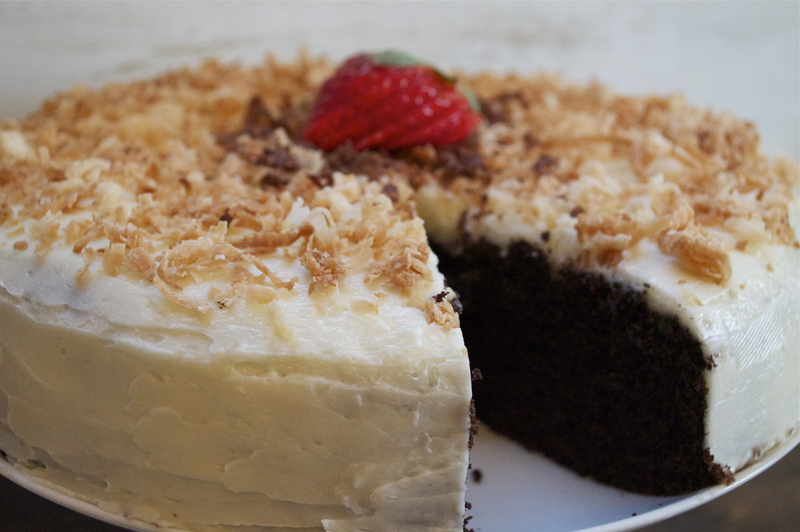 Pour yourself a cup of coffee, take a slice of cake, and enjoy! Winter blues be gone!